Following quickly after the success of Fire's 2009 release Thrill Me, Avenue of Allies (AoA) brings the bands debut work Ignite. A reissue for the band, but a first issue for AoA, Ignite was only published on the band's home turf, the island of Malta. Just like Thrill Me, this disc is unadulterated melodic hard rock, Eighties-style, with a strong emphasis on the rock n roll side of things. Songs like Conspiracy, Get Out of My Way, Taste This, and especially the fantastic Fire Flyer are deliberate rockers that can get your toes tapping and your fist pumping. Then Fire can back off with a subtle groove on Manhunter. A good power ballad isn't far away on Goin Down, showing Fire's ability to inspire rather than soak with saccharine. But, ultimately, Fire is at their best when the combine that spirited rock beat with strong melodies and terrific hooks as on Away for Good or Home and Dry. Ignite contains two bonus tracks for this reissue: a cover of Bryan Adam's Run to You and a Christmas song, Miss You this Christmas. As to the former it's fine, but it will more likely cause you to want the original. To the latter, it's more sentimental than cheer for Christmas. Overall, Fire's Ignite encapsulates the band's strong beginnings in creating fundamental melodic hard rock. If you liked 2009's Thrill Me, you should definitely add this disc to your collection. Recommended. 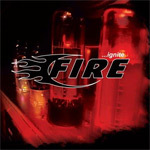 Fire's Ignite encapsulates the band's strong beginnings in creating fundamental melodic hard rock. If you liked 2009's Thrill Me, you should definitely add this disc to your collection.